The 2017 Ford Mustang builds upon a legacy of performance, style and innovation. Drivers in Alexandria, VA, and Annapolis and Clinton, MD can test drive the new Mustang at Waldorf Ford and witness firsthand how the it leads the pack of American muscle cars. Dominate the streets of Southern Maryland with the agile and powerful 2017 Mustang. It comes standard with a 3.7L V6 engine and has 3 more available engines: the 2.L EcoBoost®, 5.0L V8 and 5.2L V8, which delivers 526 horsepower. Drivers can also opt for the available Brembo® performance brakes, which gives Mustang fans the stopping power they need to stay safe. The new Mustang features an eye-catching aerodynamic design and a profile that is much sleeker than its competitors – the 2017 Dodge Challenger and 2017 Chevrolet Camaro. 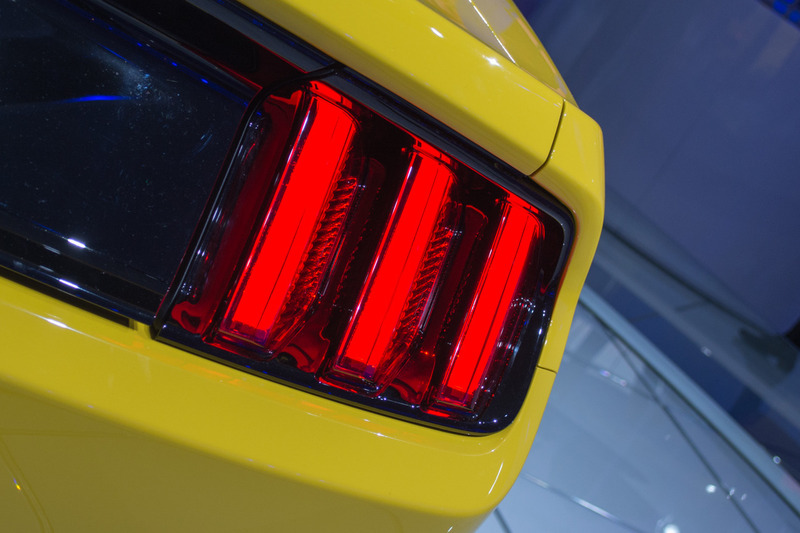 The 2017 Mustang comes with HID headlamps, tri-bar taillamps and dual exhaust pipes. The new Mustang comes in 10 impressive trim levels and has hardtop and convertible options as well. The new Mustang offers a refined, driver-centric cabin. It features a sporty layout with front bucket seats, a standard rearview camera, 2 smart-charging USB ports, push-button start and Track Apps™. Meanwhile, all the information and entertainment you want is easily accessible with the 2017 Mustang’s available SYNC®3 infotainment system and voice-activated navigation program. Take the 2017 Ford Mustang out for an exhilarating test drive today at Waldorf Ford. We proudly serve drivers in Annapolis and Clinton, MD and Alexandria, VA. The Ford Mustang has been around for 51 years, with the first Mustang produced in 1965. Since then, generations of Ford lovers have come to cherish the sporty car, at car shows, with collector’s editions, and with memorabilia. Here at Waldorf Ford, we love the Mustang, and we’re sure that you’ll fall in love, if you haven’t already. With models that acquire 31 highway miles per gallon, and 22 in the city—the 2017 Ford Mustang is nothing short of spectacular. You’ll have the option to purchase your new Mustang with a 6-speed select shift manual transmission and a 2.3L EcoBoost Engine, or a 6-speed automatic transmission and a 5.0L V8 Ti-VCT engine, your ride will never be boring. We have a wide variety of colors and trims to choose from, as well as both convertible and hard-top models to choose from. If you’ve had your eye on a Mustang for a while, but weren’t quite sure whether or not the Mustang lifestyle is for you, we have the perfect way to help you decide. On Saturday, September 10, Waldorf Ford will be hosting the Southern Maryland Mustang Club Show. Stop in, mingle, check out the beautiful cars on display and decide for yourself. We’re sure you won’t regret your decision, that is, if you choose to buy one. FOR MORE INFO CLICK HERE TO VISIT THE SOUTHERN MARYLAND MUSTANG CLUB’S WEBSITE! CLICK HERE TO SEE PHOTOS FROM LAST YEAR’S SHOW! WALDORF FORD IS LOCATED AT 2440 CRAIN HIGHWAY IN WALDORF, MARYLAND 20601. WE CAN ALSO BE REACHED AT 301-843-2400 OR ONLINE AT HTTP://WWW.WALDORFFORD.COM. For Ford Mustang fans everywhere, today they are one big step closer to experiencing the next generation as Ford has begun accepting dealer orders for the 2015 fastback. Ever since the world got its first look at the all-new 2015 Mustang nearly six months ago, the anticipation has been palpable. Ford engineers have been racking up millions of testing miles, refining each system to make sure everything is just right before the first Mustangs reach customers later this year. A 50 Years appearance package is available for Mustang EcoBoost Premium and Mustang GT Premium models. The appearance package includes a chrome-accented grille, round 50 Years rear badge, 19×8.5-inch alloy wheels with 255/40R19 all-season tires, anniversary floor mats and unique seat and door-trim stitching. The 2015 Ford Mustang fastback with 3.7-liter V6 starts at just $24,425 including destination and delivery charges in the United States. Mustang will be available from Ford dealers in North America this fall. Visit Waldorf Ford 2440 Crain Highway, Waldorf, MD 20601 or call us at 301-843-2400 or visit us online at http://www.waldorfford.com. WALDORF, MD, 2014 – Fifty years after debuting one of the world’s most popular cars, Ford is marking the milestone by revealing a Mustang 50 Year Limited Edition. Created to honor five decades of Mustang heritage, only 1,964 examples of the 50 Year Limited Edition will ever be built when it goes on sale this fall. “When Mustang was approved for development more than 50 years ago, I don’t think anyone imagined it would spawn such a dedicated base of fans around the world and still be in production today,” said Greg Basiliko, General Manager of Waldorf Ford. Based on the all-new 2015 Mustang GT fastback with performance pack, the 50 Year Limited Edition is designed to provide customers with outstanding performance and a unique appearance that will be instantly recognizable on the road. The only options for the 50 Year Limited Edition are the choice of two exclusive colors and a six-speed manual or automatic transmission. The only two available colors are Wimbledon White, like Mustang serial No. 0001 that was first sold to Capt. Stanley Tucker in April 1964, or Kona Blue. Both are exclusive to this limited-edition car. Chrome bezels surrounding the base of each of the three taillamp blades take inspiration from the original 1962 design proposal by Gale Halderman that became the basis for the production model that debuted in 1964. The three individual lamps on each side of that design were combined into a single tri-bar lamp cluster for production, but the original concept has returned five decades on. 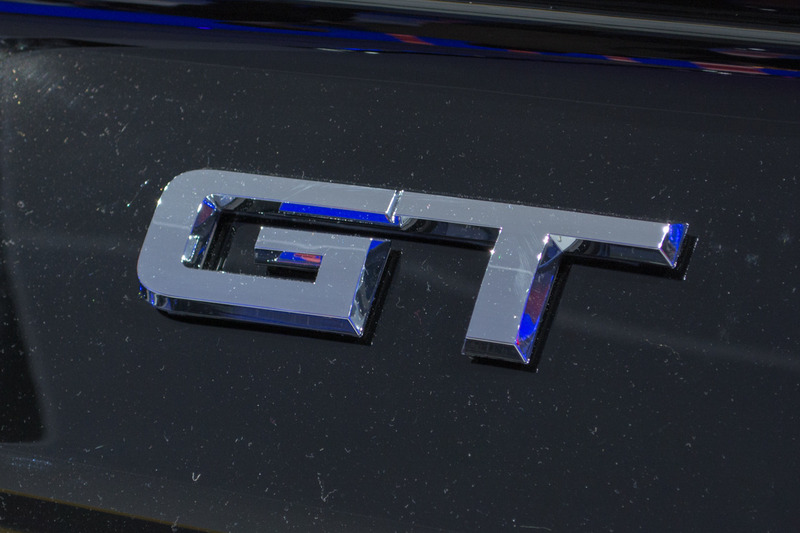 The Mustang 50 Year Limited Edition will be the only 2015 model with the large faux gas cap badge on the rear fascia, with 50 Years added to the GT designation. 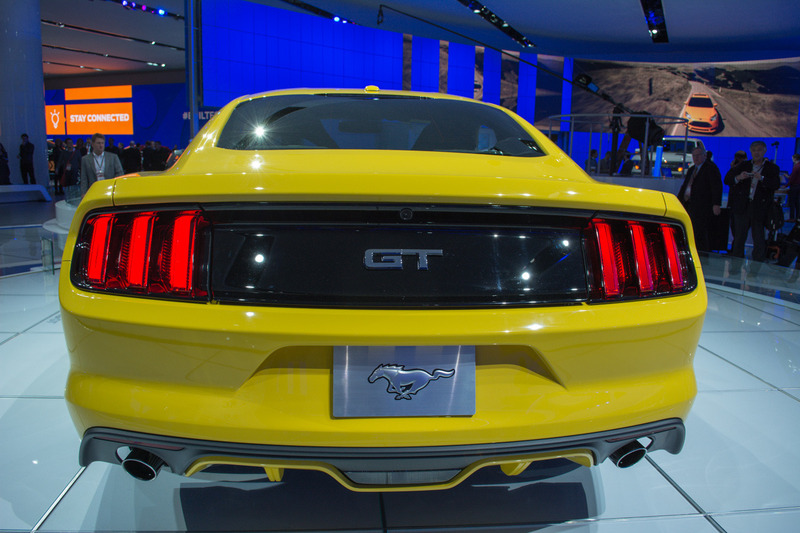 Another visual element that won’t be found on any other Mustang is the louvered rear quarter-windows. Unlike the external louvers on the quarter-windows of the 1965 fastback, the new windows are comprised of layered sheets of glass built with a construction technique uniquely developed for this car. From behind the wheel, drivers will know they are driving a very special car. The aluminum trim panel that spans the double-brow instrument panel gets an axel spin finish different from other 2015 Mustangs, plus a special serialized 50 Year Limited Edition badge on the passenger side. Each badge will be individually etched at Flat Rock Assembly Plant where Mustang is built. The limited-edition is the only 2015 Mustang with a cashmere-stitched, leather-wrapped steering wheel. The stitching is also used on the instrument panel, shifter boot, center armrest, door inserts and seats. The seats feature exclusive two-tone cashmere and black leather upholstery, and the Mustang 50 Year logo on the seat backs. Limited-edition cars will be equipped with loop-carpet floor mats with cashmere stitching and suede binding not available on other Mustangs. Powered by the upgraded 5.0-liter V8 engine delivering more than 420 horsepower and 390 lb.-ft. of torque, every 50 Year Limited Edition will be equipped with the Mustang GT performance pack that includes massive six-piston Brembo front brakes and 19-inch alloy wheels with high-performance Y-speed-rated Pirelli P-Zero summer tires. The 19-inch alloy wheels feature a unique Y-spoke design inspired by the chromed steel wheels that were offered on the original Mustang 50 years ago. The front wheels are 9.0 inches wide with 255/40R tires, while the staggered rear wheels are 9.5 inches wide with 275/40R tires. The 50 Year Limited Edition is the only 2015 Mustang that will be available with a combination of an automatic transmission and the performance pack. When equipped with the six-speed automatic transmission, the Mustang 50 Year Limited Edition will get a limited-slip rear differential with a 3.55:1 final-drive. Customers who opt for the six-speed manual will get a Torsen differential with a 3.73:1 final-drive ratio. The 50 Year Limited Edition car will be among the first 2015 Mustangs built when production begins later this year. Each of the 1,964 50 Year Limited Edition Mustangs will get a unique owner’s guide in a leather portfolio with the 50 Year badge on the outside. Visit Waldorf Ford for more information and don’t forget to join us for the 50th Anniversary of Ford Mustang Thursday, April 17th, 2014 from 5:30 – 8pm! Click here for more info on this event! Waldorf Ford is located at 2440 Crain Highway in Waldorf, MD 20601. We can also be reached at 301-843-2400 or online at http://www.waldorfford.com. Join Clarence Ball – Top Selling Ford Mustang Sales Consultant for the 50th Anniversary of Ford Mustang! In honor of the 50th Anniversary of the Ford Mustang Celebration that will be held at Waldorf Ford on April 17th, 2014 from 5:30 pm to 8 pm we thought it would be great to highlight one of our Top Selling Mustang Sales Consultants, Clarence Ball! Originally from Maryland, Clarence has been with Waldorf Ford for over 13 years. Clarence has always been an active member at the dealership and in the community. He has volunteered at many events including multiple Mustang Shows just like the 50th Anniversary of Mustang coming up this Thursday, April 17th, 2014. His love for automobiles and especially the Ford Mustang shows. During his time at Waldorf Ford he has sold hundreds of Ford Mustangs! When we sat down with Clarence, we wanted to find out what made The Ford Mustang so special to him and to compare it to other Ford’s. “The Ford Mustang is a sports car that has an aggressive look. The Mustang’s look makes it stand apart from all other muscle cars in the market.” When asked what his favorite mustang was he stated “It’s difficult to pick just one mustang. I have several. One of my favorite vintage mustang is The Bullitt Mustang that Steve McQueen drove in The 1968 Movie, Bullitt. The Bullitt’s clean lines, color options, and upgrades (including being 10 to 15 Miles per hour faster than the Mustang GT) embody the true spirit of the Ford Mustang. As far as current Mustang models Clarence loves the 2014 Ford Mustang GT 500. The reason for him is because it’s the fastest production mustang ever but he also reminded us that he is also a huge fan of 2009 and up Mustangs as well because the body style had changed. Clarence thinks that the 50th Anniversary of Ford Mustang is an important event. Whether you’re a Ford Mustang lover or not it’s important to learn about and celebrate this iconic American Muscle Car. “People should come out to Waldorf Ford on April 17th, 2014 from 5:30 am to 8:00 pm to our 50th Anniversary Party to celebrate and take a walk down memory lane” said Clarence Ball. For more information on our event visit Waldorf Ford’s Facebook Page or visit us on April 17th, 2014 at Waldorf Ford at 2440 Crain Highway in Waldorf, MD 20601 from 5:30 pm to 8 pm! Hope everyone joins us! WALDORF, MD – Ford Mustang is about to become the newest member of a very exclusive club: vehicles in continuous production for 50 years. In its first 49 years, Mustang has gained a worldwide base of avid fans, including more than 5 million on Facebook, the most of any vehicle nameplate. The car’s unique combination of style, performance and affordability established an entirely new class of sporty cars, and Mustang has led the segment ever since. To celebrate that tradition and look ahead to a bright future, Waldorf Ford is throwing a Mustang 50th Anniversary party on April 17th, 2014 from 5:30 pm to 8 pm. The Mustang Club of Southern Maryland will be on hand with vintage Mustangs representing five decades of brand history. Waldorf Ford will also provide food, refreshments and 50 Years of Mustang favors! Customers will also have the opportunity to sign up for the “5.0 Fever Sweepstakes” . Once entered gives customers the chance to win a 2015 Mustang GT! We hope you join us to help celebrate the 50th Anniversary of the Ford Mustang at Waldorf Ford, April 17th, 2014 from 5:30 pm to 8 pm! Waldorf Ford is located at 2440 Crain Highway in Waldorf, MD 20601. Call 301-843-2400 or visit us online at http://www.waldorfford.com!